When picturing time spent lazing on a beach, typical travelers visualize a white sand beach with swaying palms set against a sparkling ocean and a searing sun. 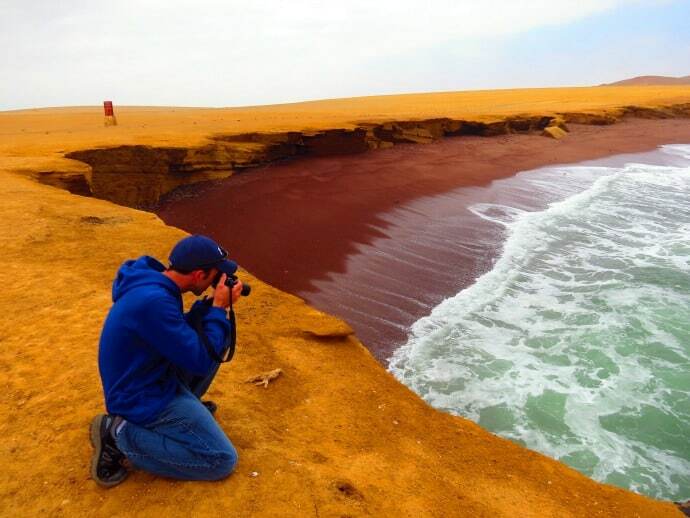 But there are uniquely colored beaches located all over the world, with sand in varying shades of red, green, orange, purple, pink, pure white, midnight black and golden brown. They look nothing like what people think of as the classic beach scene, and many of them really need to be seen to be believed. Sand is the product of erosion. It forms from a combination of inland rocks and sea cliffs wearing away, as well as particles washing inland from marine organisms and deposited onto shore. So whether it’s due to years of volcanic activity or miniature coral fragments that mix with white sand to form a lovely pink tone (depending on what the rocks and cliffs surrounding the beach are made of), a coastline can take on an entirely different hue. From the red beach of Playa Roja in Peru to the olive green shores of Papakolea Beach in Hawaii, the following are our picks for the World’s Most Colorful Beaches. Boasting incredible natural beauty, with miles of cliffs and coastal waters, Paracas National Reserve is where the desert of Peru dramatically meets the sea. 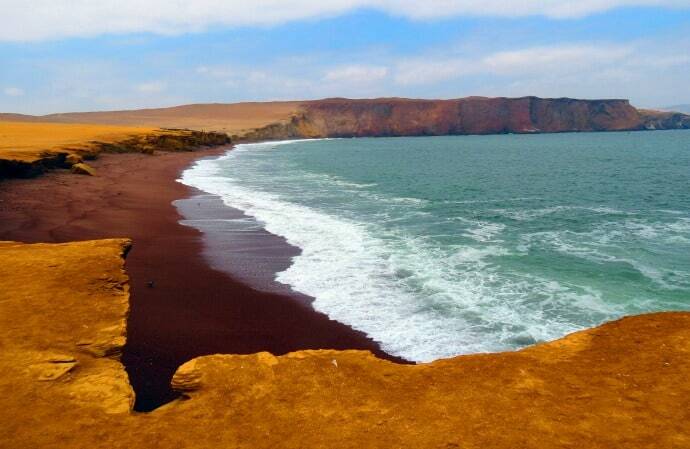 The most stunning views can be witnessed from Playa Roja, one of the most beautiful beaches in the Paracas National Reserve due to its reddish colored shore. This unusual characteristic gives this beach a unique beauty that leaves visitors in awe. The red color of the sand comes from the nearby massif of Punta Santa Maria, which was formed by a sort of igneous rock known as pink granodiorite, which contains solidified magma inside. When breaking against the cliffs of Punta Santa Maria, the waves carry away fragments of the reddish rocks. When these settle on the shore, it provides a beautiful contrast to the yellow and ochre colors of the cliffs. Another beach with vivid red sand is Kaihululu in Maui, Hawaii. The volcanic cinder cone which surrounds the beach gives the sand its red color. 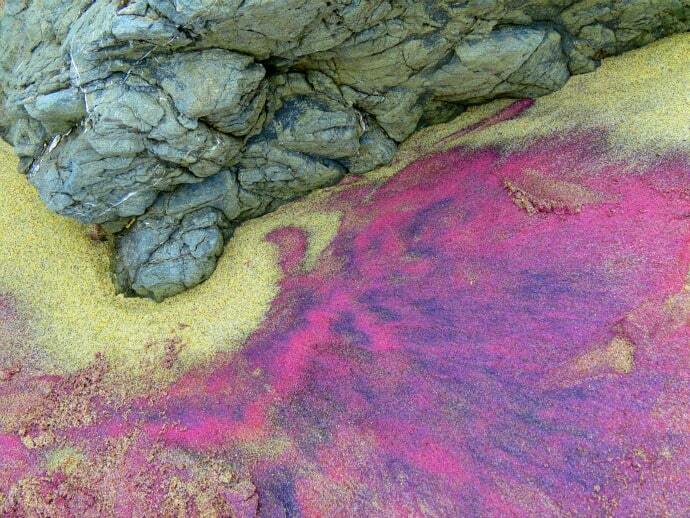 Pink sand beaches are found in a number of different locations around the world. Harbour Island, in the Bahamas, is home to one of the most famous, with the sand’s pale color a result of red coral in the waters. 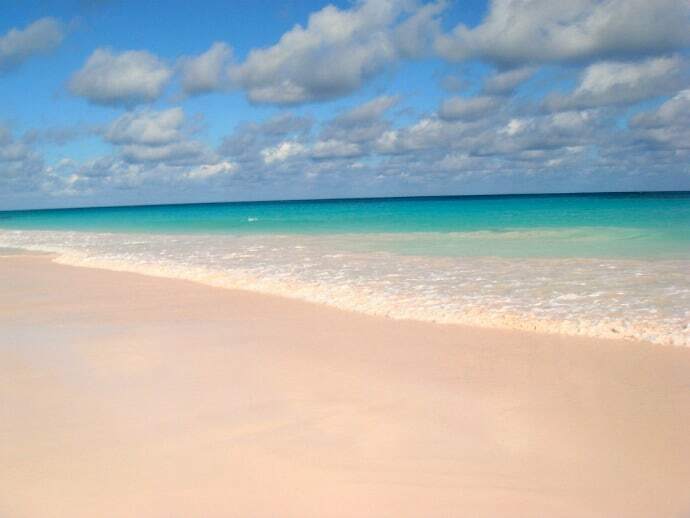 Picture three miles of a baby-pink sand beaches and it’s no wonder why this Caribbean island has become an increasingly popular tourist attraction. A similar process– crushed shells and coral fragments mixed with white sand to form a lovely pink hue– occurs on Horseshoe Bay in Bermuda. Located in Southhampton, the bay’s coastline stretches for miles. For those in the Southern Hemisphere, Tangsi Beach is one of two beaches in Indonesia where fragments of red coral turn the sand pink. Tangsi Beach is located in Lombok, while the other can be found on Komodo Island. 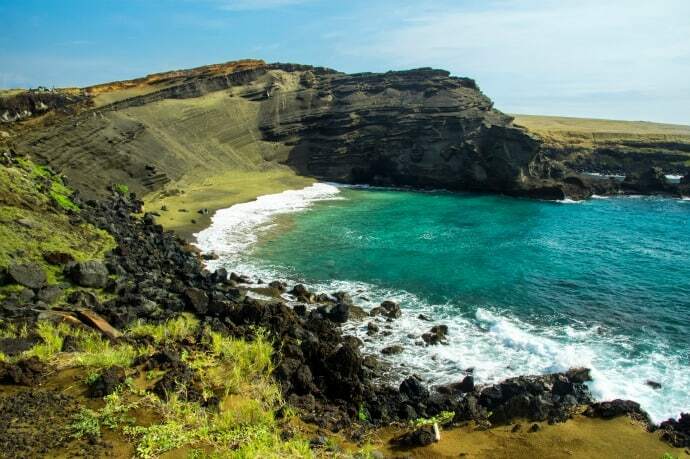 Papakōlea Beach is located in the Kaʻū district on the southern tip of Hawaii’s Big Island, and is one of four beaches in the world known for their beautiful green sand. The others include Talofofo Beach in Guam, Punta Cormorant on Floreana Island in the Galapagos, and Hornindalsvatnet in Norway. Olivine crystals from surrounding lava rocks in the Pu’u Mahana cinder cone of Mahana Bay give the sand its unique green color. The gem quality form of Olivine– a silicate material that contains iron and magnesium– is known as Peridot. It’s also known as “Hawaiian Diamond,” and found in the famous Diamond Head landmark. 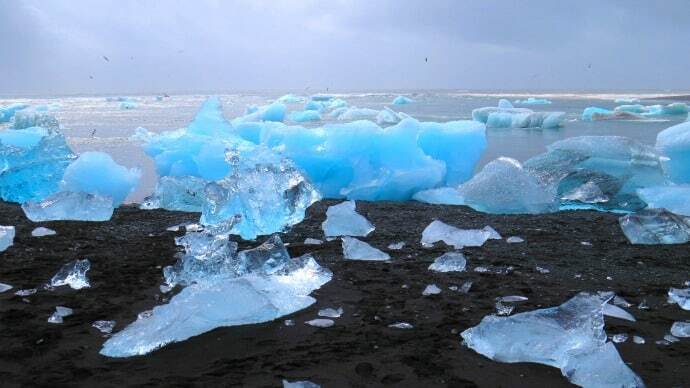 Interestingly, these crystals are broken down by weathering and the combination of carbon dioxide and water. So while the constant erosion of the Pu’u Mahana cinder cone currently ensures a steady supply of green sand, eventually it will run out and the beach will look normal again. 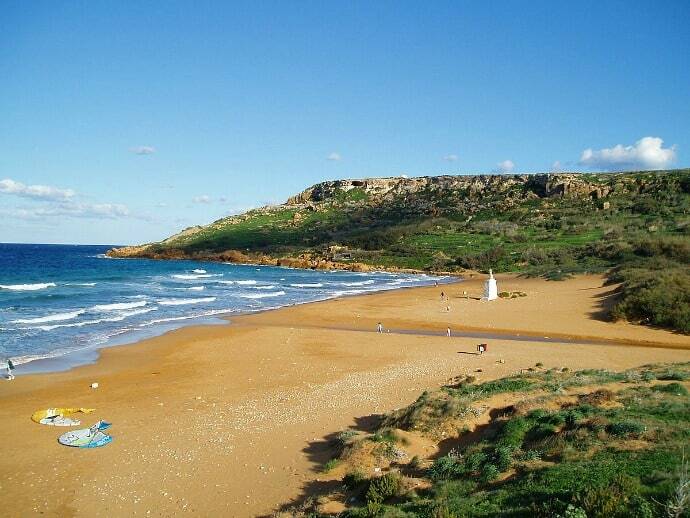 The beach at Ramla Bay, on the Maltese island of Gozo, is as vividly orange as it comes. An abnormally high iron content in its sands gives the coastline its bright orange color, making the beach a popular attraction for travelers visiting the Roman ruins in nearby Calypso Cave. The beach at Porto Ferro in Sardinia in Italy also hosts bright, orange-coloured sand. Here, the coloration is due to an abundance of orange limestone, crushed shells and volcanic deposits in the area. There are also spectacular 65-foot high sand dunes behind the beach. Just as not all sandy beaches are white, not all beaches are made from sand. When we talk about the famed glass beach of MacKerricher State Park in California’s Fort Bragg, we’re not talking about the occasional piece of sea glass mixed into the sand. 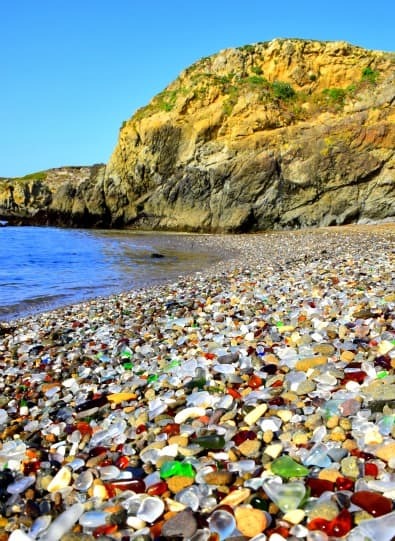 There are three beaches at Fort Bragg where there is no sand in sight: Each is completely covered with recycled sea glass, with entire coves lent a dazzling array of color by the huge amounts of glass washed ashore by the rolling waves! The site was formerly a city trash dump. From 1906-1976, everything from cars and cans to bottles and batteries was pushed over the cliffs into an area of the coastline. What was biodegradable degraded over time. 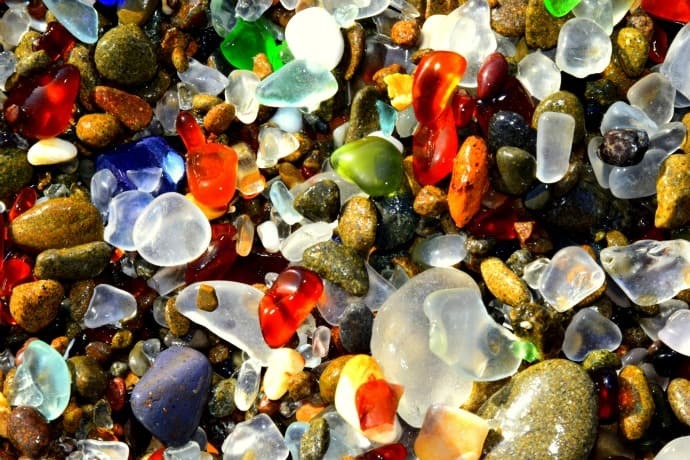 The pounding ocean waves broke everything else down and gradually tumbled the pieces into small, smooth colored glass pieces, which now give the beach a stunning jewel-like quality. Not to be confused with the beach at Julia Pfeiffer Burns State Park (which lies a few miles south), Pfeiffer Beach in Big Sur, California, is widely considered one of the most beautiful beaches in the Monterey area. It’s also extremely popular among photographers. The main attractions here are a massive rock arch boulder lying just offshore and vivid patches of violet sand that make up the beach. The curious color is created by quartz and manganese garnet deposits that wash down from the rugged rock formations of the nearby hills (which reminded one visitor of the Big Thunder Mountain Railroad ride at Disneyland). If you’ve never been there before, the beach can prove difficult to find. It’s located at the end of unmarked Sycamore Canyon Road, which is the only paved, ungated road on the west side of Highway One between the Big Sur Post Office and Pfeiffer Big Sur State Park. There are actually many black sand beaches around the world, including Muriwai Black Sand Beach in Auckland, New Zealand; Punalu’u Beach, located between Pāhala and Nāʻālehu, in Hawaii; and the beach in Vík í Mýrdal and Jökulsárlón, in Iceland. The black color of the beaches generally comes from volcanic materials, with lava flowing into the ocean and basalt rising to the surface as the lava rapidly cools. It then washes back onto land to form a beautiful black beach, although the presence of iron and titanium also plays a part. White sand beaches are undoubtedly more in line with most people’s traditional notion of what a perfect beach should be. 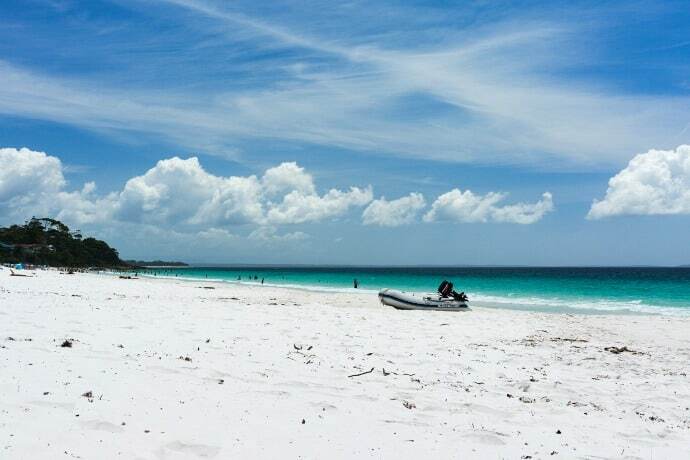 While there are many white sand beaches across the globe, Hyams Beach in New South Wales, Australia, is arguably the whitest. And that’s not just our opinion: The beach is actually listed in the Guinness Book of World Records as having the whitest sands in the world. This post was brought to you in part by Expedia.com. 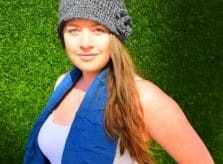 Megan Jerrard is an Australian Journalist, and the founder and Senior Editor of Mapping Megan, an award-winning travel blog bringing you the latest in adventure travel from all over the globe. With a mission to inspire others to embark on their own adventure, Megan and husband Mike believe that travel has the potential to inspire change in people, and in turn inspire change in the world. They embraced travel as a lifestyle in 2007, and are dedicated to documenting their journey and observations through entertaining, candid articles and brilliant photography. You can follow their journey on Facebook, Twitter, Google+, YouTube, Pinterest and Instagram.